Remember Groupons? That shortlived fad a few years ago where you’d get emailed an offer for a deal voucher at “half price” that had to be used by a certain date? You then forget about it until you get a reminder email that you have a couple weeks to use it before it expires. At that point, regardless of where you really want to eat, you feel saddled with the grim reality that you can either go eat at the mediocre restaurant you bought a Groupon for, or let it go to waste, wasting the money you spent on it. This dilemma will be a little more common to you if you recently bought a new 21 game Padres season ticket package that has reportedly removed the benefit of being able to trade your tickets for other games; or in the context of the Groupon metaphor, that mediocre restaurant is that Tuesday night Padres game vs. the Marlins that you got stuck with in the package. I’ve made it no secret that I have been an unabashed fan and supporter of the Padres’ fan friendly season ticket policies, specifically the ability to trade the value of each season ticket for a similarly valued seat at any other game. The basic policy was that you could trade weekend tickets for weekend tickets, and weekday tickets for weekday tickets. This allowed so much flexibility and in the end, is the main reason I continue being a season ticket holder. 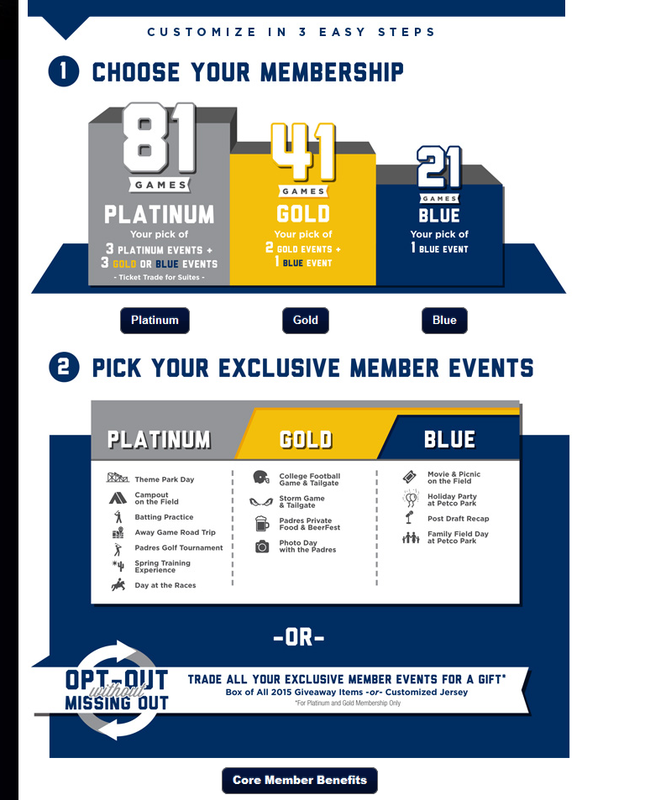 Unfortunately, it appears that the Padres front office, after building so much goodwill this offseason despite keeping payroll in the bottom third of MLB payrolls, has yanked this popular feature from their membership program for new 21 game season ticket holders. They are grandfathering in renewal members to the flexible ticket trading feature for 2015. There are two basic issues here. 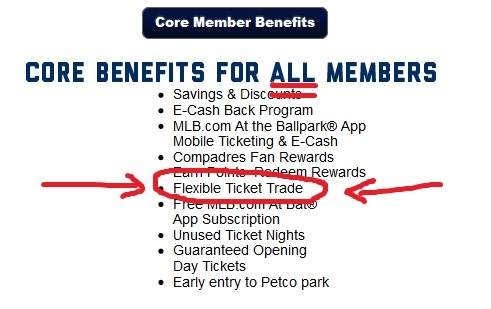 One is that padres.com’s Membership page specifically states that Flexible Ticket Trading is a “core benefit for all members”, which would seem to imply it’s a feature for, well, all members. The second issue is that stripping the ability to trade tickets totally devalues the 21 game package, raising into question the economic wisdom of pre-buying 21 games instead of buying tickets piecemeal via Stubhub. And down there at the bottom is the button for Core Member Benefits. These are the benefits, regardless of member level you select, that you should be receiving with your package. In the end, these benefits are the real reason you’d buy season tickets. As we all know, Padres tickets are rarely in short supply, so there is not much need to secure seats lest you can’t get a seat for a game. So let’s take a look at those core member benefits, shall we? And there it is, flexible ticket trade, a benefit for “ALL” members. As we learned tonight, this is no longer the case. The Padres have officially removed this benefit from new 21 game packages. There was some debate as to whether this benefit was sold to 21 game members by ticket sales reps, and we here at Gwynntelligence received one alleged instance via the Tweeter. To verify that this benefit has, indeed, been taken out of the program, we went to Wayne Partello, Padres Chief Marketing Officer. 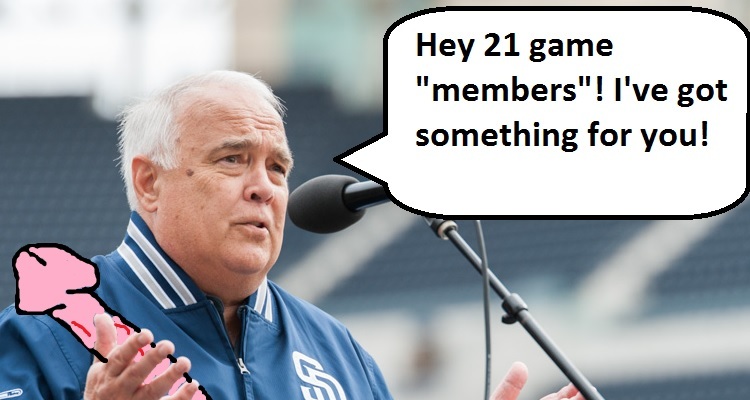 @PadresJagoff @ChangeThePadres new 21 game members do not have the benefit. Past/renewed members still have the benefit. 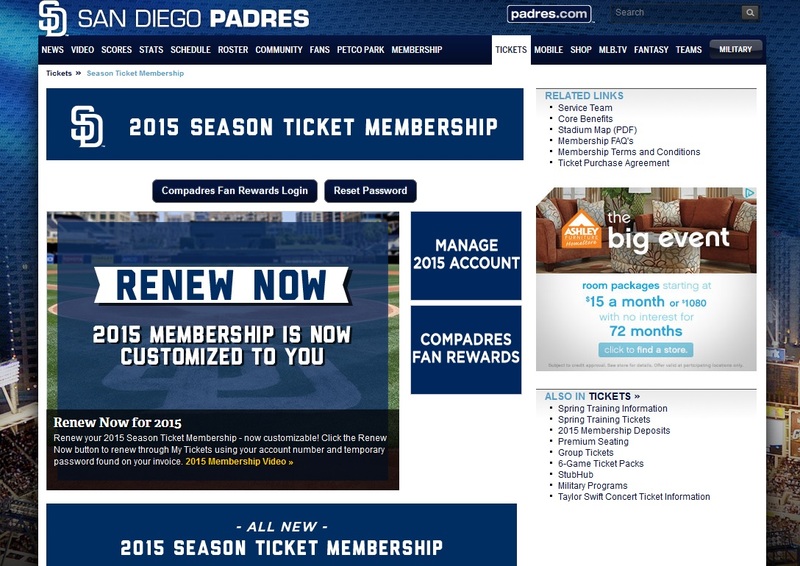 @ChangeThePadres @PadresJagoff the screenshot page was a renewal page. The 2015 membership deposit page does not have that info. @ChangeThePadres @PadresJagoff none of the new memberships were sold online. All sold with a rep and benefits should be clearly outlined. Scroll back up and look at the screenshots. While one of the featured stories is about renewing, the basic information seems to be just that, basic information on ticket memberships. I’ll continue to argue that the statement “Core benefits for all members” should include those that have purchased new 21 game packages. 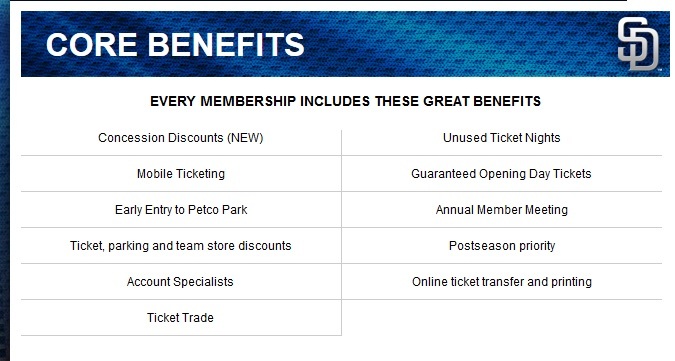 As if that wasn’t enough, the Padres actually have an entire page devoted to membership Core Benefits on their website, which specifically states that “Ticket Trade” is a benefit for “every membership”. While I don’t believe the Padres and Mr. Partello are deliberately trying to deceive customers, it at the least is negligent and could be perceived as deceptive. Looking at my Twitter traffic tonight, I’m not alone in finding this labeling deceptive – especially when you factor in the months of deception in 2014 related to selling beer at one quantity and price, while having signage stating a larger size. @PadresJagoff @ChangeThePadres there is no attempt at deception. The page buttons could be labeled better. Thanks. OK, so let it be known, the greatest and most valuable feature of buying season ticket memberships is not available to everyone that wants to buy a 21 game package. That brings us to the second issue: why buy a 21 game package at all then? As you saw on the core member benefits, there are certainly some benefits to holding a membership card. Some of the more useful ones are early entry to Petco Park, especially on giveaway days, participation in Compadres Club rewards which will provide you little to no value as anything less than a premium seat full season ticketholder, and a built in discount off of face value. So on the 300 level tickets I have, I am saving between 2 and 3 dollars per ticket by putting the money up front and pre-buying 21 tickets. For some, the stability and knowledge that they have those tickets is worth fronting the money. For the economically rational consumer, it is usually a better deal to just buy gameday tickets on Stubhub from fellow 21 game season ticketholders that are unable to go to the games that they prepaid for. In fact, if anything, this new policy by the Padres should increase the supply of unused gameday season tickets and theoretically, drive the prices down. Before this program devaluation, you could simply trade your tickets for another game at a later date when you realized you couldn’t make a game. Alas, no longer. Of course, there is a cost when you can’t make a game and your ticket goes to waste. The residual value of an unused ticket is nearly nothing. In fact, it’s only value is on Unused Ticket Nights, which are thankfully still a benefit, but these nights generally fall during the week when you may or may not be able to make it. If you miss a few games, you’ve already lost out on that money you saved by prepaying for the 21 game package, losing the value, while being locked into the rigid schedule that you prepurchased. I ask again, why do this if you aren’t afforded the flexibility of being able to trade your tickets like previous years Members have been able to do? The value proposition is greatly weakened by this terrible devaluation. Save some money, increase your flexibility (which in the end, may be more valuable than the couple of dollars you’d save by prebuying), and steer clear of the new, devalued 21 game membership package. Thank you so much for writing this article. I had no idea. This is infuriating. There is zero reason to have a 21 game plan without the ticket flexibility. In every survey I took, I indicated the most important thing to me was the flexibility. Is Wayne Partello the right person to vent to, or is there someone else I can call? If they do away with this benefit after 2015 for those that renew, there’s no way I’m renewing. Yes, Wayne Partello will actually listen to your concerns. He clearly was seething with rage when I was messaging him yesterday which may explain his curt responses, but perhaps you’ll get a more complete explanation of why the devaluation happened. To me, it makes no sense to turn an incredibly fan friendly policy into a distinctly fan unfriendly policy, especially when the effect on revenue/profits is negligible at best. The Padres are further screwing with membership benefits by limiting how many games you can sell on stubhub. If you sell more than 50%, they will terminate your account. This is not written down anywhere and Sindi Schug, Director of Membership Services, REFUSED to put it in writing at first. We had to send her an email with her stipulations in it. Her basic premise is that you shouldn’t buy more tickets than games you plan to attend. I believe the real reason is they don’t want to sell excellent locations at membership prices. They want to get full price for them. This has also happened to other members. What is happening with this? Anyone filing a class action lawsuit? Fro 2016, the no exchange policy now applies for ALL 21 game memberships, not just new ones. I will NOT renew!! Beware all 21 game season ticket holders you will no longer have the flexible ticket trade starting in 2016. I will be flexible and drop my six tickets which I had renewed since 1997! How are the 21 games selected? Are they given to you or does the season ticket holder get to choose? They are given to you. You used to be able to trade your games but the team ended that benefit for new customers last offseason. The team wants you to have to call in to receive a pressure sales pitch. My tickets in the 300s were $420 this offseason. Unfortunately, I’m not renewing due to the removal of the ticket trade program. Unless you are 100% certain you will go to every game in your package, I’d recommend looking at stubhub to get tix on an ad hoc basis. Late to the party here. I didn’t realize the change affected the long-term holders. We were told we were “grandfathered in” I guess grandfathered in means one season. But what are the benefits of being a 21 game ticket holder? There really aren’t any at this point unless you are 100% sure you won’t miss any games. Miss 2 games and you completely negate the value of the face value discount. I believe there will be no 21 game plan soon. I have complained a great deal and have not even received the courtesy of a routine acknowledgement letter. Apparently all of the 21 game plan loyal ticket holders are being punished for those who exchanged tickets for higher valued seats in the past. available to identify who is who. MLB is becoming the National Exclusionary Past Time! Especially as the Padres operate! how many tickets were sold for the 2016 season?